Like many around my age, I came aboard the "Snake train" in the very late eighties but have come to love every incarnation before and after. I accept that (these days) David Coverdale doesn't have the live voice that he once did, but then for me it's always been about the overall "fun and entertainment" value rather than just simply the main man's singing. 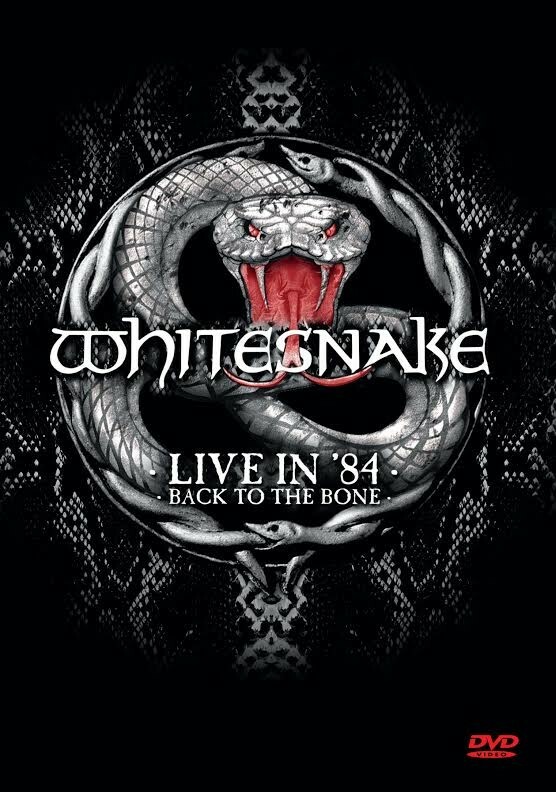 To commemorate the 30th Anniversary of 'Slide It In', Frontiers and 'Snake have unearthed some rare and historical footage and released it for the first time as a live CD/DVD entitled 'Live In 1984: Back To The Bone'. It's also worth point out the importance of this release on the personnel front. There were line-up changes during both recording and the subsequent tours documented here and now thirty years on, three members involved (in one form or another) have passed away giving everything an added poignancy. I'd also like to clarify one thing from the off; despite "no expense spared and utilizing present technology to improve sound and picture" (personally overseen by Coverdale) these recordings (both DVD and CD) are very much of their time so if you are expecting Hi-Def footage and super clear audio that matches regular live releases in the modern day...you may be a little disappointed. Coverdale and producer Michael McIntyre have scoured and searched for the best "available" footage and recordings from 1984; including some taken from the singers own private collection. The DVD portion consists of three parts; the main body is made up of footage from the Super-Rock (Japan) performance in 1984 with a second segment showcasing Jon Lord's final show with the band recorded in Sweden. The final part is a bonus 'Slide It In Slide Show' that features rare unseen photos over a "musical bed" of private demos from Coverdale's personal achieves. The Super Rock performance sees Coverdale, John Sykes, Neil Murray and Cozy Powell tearing through eleven tracks (including drum and guitar solos) including the likes of 'Gambler', 'Guilty Of Love', 'Love Ain't No Stranger', 'Ready An' Willing' 'Slow An' Easy', 'Soldier Of Fortune' and 'Don't Break My Heart Again'. The Lord final performance sees the legendary keyboardist playing on each of the first four songs above; although you don't actually see that much of the great man, his audible input is noticeable especially if watched straight after. These may not be the greatest 'Snake performances I have witnessed, but they are fun to watch given such legendary members on stage. Whitesnake being Whitesnake, the audio disc portion of this release isn't what would be expected. Often combination packages simply offer an audio version of the DVD...but not this one. Instead you get a different set of recordings called 'Snakeskin Boots – The Best Of Bootlegs' which is a collection of nine alterative recordings of similar tracks to the Super Rock show. Again, the sound quality isn't the greatest but then they are bootlegs and for me personally that kind of adds to the charm. Speaking of charm, Coverdale is on sparkling form in these recordings; only The Cov could get away with uttering "some advice" that "if it's in deep... if it's in long and if it's in hard... then it's in decent"...honestly I spat out my drink over my laptop during the first listen (and that's after his mention of the album title and bananas!) The audio disc is closed out by three recordings from the Super-Rock show and the four tracks from Lord's final performance as per the DVD. Although this release doesn't have the modern recorded standards we generally expect today, it is still a quality DVD/CD combo showcasing one of the greatest Hard Rock bands (with a memorable line-up) and front-man (in my opinion) doing what they do best, which is play live. As a Whitesnake fan, I am thrilled to have this nostalgic entry in my collection and I am sure many other 'Snake fans will be, too.